Calling all BlackBerry users, BlackBerry recently launched a “Stop Missing Out” campaign, offering Malaysian customers a chance to spend some time with their favorite local celebrities. All you need to do is snap a picture you with your BlackBerry smartphone, explain in less than 20 words how your BlackBerry device keeps you connected, and you just might win the chance to spend the day with celebrities including Daphne Iking, Aizat Adman, Rina Omar or Nazrudin Rahman. That’s not all, as a Lowyat.NET reader, BlackBerry will also give you a chance to win something extra so hit the break to find out more. The Stop Missing Out campaign will run from 14 July to 21 August 2014. Just pose and snap a picture of your BlackBerry device and yourself, write a creative entry on how it keeps you connected, submit it to the BlackBerry “Stop Missing Out” website, and you might be the one who will get to win fun-filled outings and activities with some of Malaysia’s top entertainers and celebrities. If you are a BlackBerry Z3 user, you can submit up to five (5) entries into the contest while customers with other BlackBerry 10 smartphone are allowed to submit three (3) entries each. Any customers using BlackBerry device running on BlackBerry 7 OS or earlier will gain one entry. Snap a picture of you holding your BlackBerry device. Write a creative entry in less than 20 words about how your BlackBerry keeps you connected and submit your entries to this link (http://bit.ly/SMOLowyatNET). The winners will be picked at the end of the campaign, with five winners tagged to each celebrity. Winners will get to spend the day on exciting experiences such as going on a shopping spree, attending a gig or going on a foodie tour. 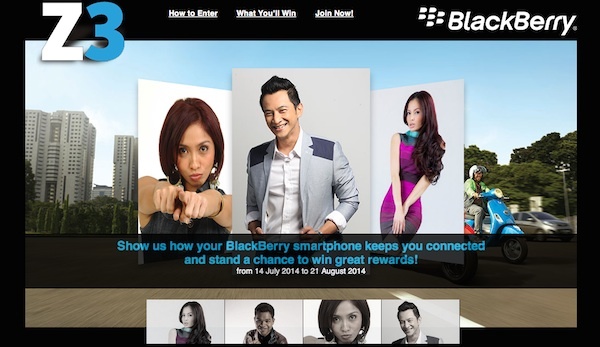 But wait, that’s not all, as a Lowyat.NET reader, BlackBerry will also include a special prize for the winners. The contest will run for 4 weeks and each week, they will give away two (2) RM50 KFC vouchers to each of the two weekly winners. In order to be eligible for the KFC vouchers, just include “(LYN)” behind your names when filling in the submission form, e.g. Henry Khoo (LYN). Submissions with “(LYN)” behind their names will be eligible for a separate weekly giveaway draw on top of the chance to have an outing with the celebrity of their choice (2 winners per week). Weekly winners will be announced every Friday on Lowyat.NET and will be contacted by the contest organizers to make arrangements to pick up their prizes. Interested? Visit BlackBerry’s Stop Missing Out page to join immediately. Good luck!